VERGE emerging art fair is proud to announce its inaugural New York event at the 4-star Dylan Hotel, March 4-7, 2010, coinciding with the New York Armory Show. VERGE is THE source for emerging art in New York, the only art fair exclusively devoted to emerging art throughout the New York art fair scene. Located only 7 short blocks from Volta, The Armory Show’s sister fair, and one block from NYC landmarks including Grand Central Terminal, VERGE is well positioned to provide a high visibility platform for the best in new and emerging art. 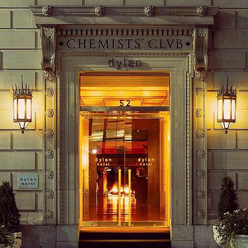 Located in the former home of the New York Chemists Club, built in 1903, the Dylan is a lavish environment in which to showcase the best in new and emerging art. Dylan’s interiors, by Jeffrey Beers of Jeffrey Beers International, mark a deliberate departure from both the too stark and overly hip designs currently prevalent in the high-end boutique hotel market. Interior design features include rich jewel-toned fabrics, Carrara marble sinks and American walnut fixtures and furnishings. The 11 foot ceilings in each guest room and suite not only complement the design, but offer a feeling of spaciousness not found in the average New York City hotel. Beers has created a timeless look for the property that redefines opulence for a new age while preserving the landmark-quality architecture of the 1903 Beaux-Arts structure. Room service is provided by the popular Benjamin Steakhouse at the Dylan Hotel for breakfast and dinner. PLEASE NOTE: Admission to the Professional Preview is given to press and VIP (both Verge, Armory Show and Volta cards are accepted) cardholders only. The Opening Night Preview is for those cardholders and for paid public admission.